You are currently browsing the Collector Model blog archives for January, 2010. Long story short (don’t worry it’ll get longer again in a minute) is that we ran into a snag in our plans to re-release the 1:1400 Enterprise 1701D. I’m not going into that right now. To be honest, the result of looking for a replacement kit is much more intriguing anyway. We keep a handful of kit ideas in our back pocket in case our intended plans go awry (which happens all too often). 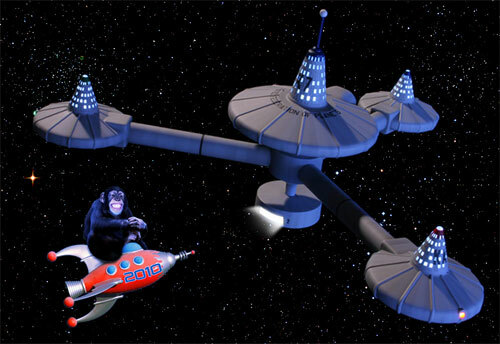 On our backup list is the U.S.S. 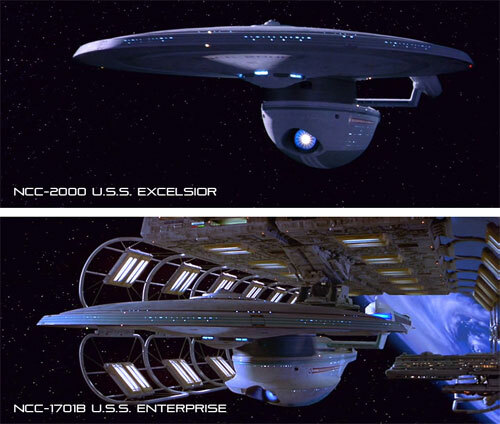 Enterprise 1701B and U.S.S. Reliant. Personally, I like the design of the Reliant but I’ve always seen an overwhelming amount of support for bringing back the B or the Excelsior. To be honest, I wasn’t very familiar with the B. I had seen ST: Generations when it came out years ago but I think we can all agree it was a pretty forgettable film. I barely remembered the Excelsior. In my mind it was the new ship that could live up to the A. It wasn’t until recently that I re-watched that one again to see that it was Scotty’s ingenuity that made the ship stall out. I could see the differences between the ships but I had never cracked open a copy of the kit. In fact, at the time, all we had was the Excelsior. Jim had copies of the kits so I had him send down some pics of them. We found that many of the sprues looked the same and probably were identical but something stood out right away. 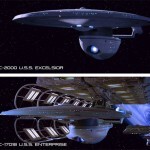 The belly of secondary hull of the B had been split into two halves while the Excelsior had been one solid piece. I could see why. The flares added onto the hull would have caused a draft issue. If the original hull tool had just been modified, the injected part would never have come out of the tool. I investigated our tool list, which is our only real documentation, and it is spotty and unclear at best. To boot, I have never gotten a clear explanation of the info included one the list. If the tool had been recorded, it shows the corresponding numbers. Most tools, which have been transferred from the US to China, have had the tool numbers documented. Most kits that have never been repopped and are still in storage in the US have no tool numbers and the tool would need to be physically searched for. 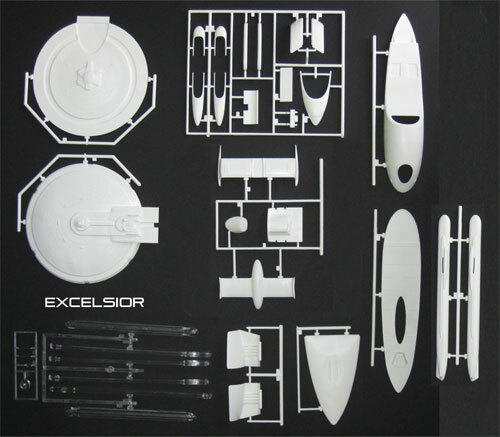 The list showed two tools were required to make the Excelsior and three tools were required to make the Enterprise B. The two Excelsior tools were the same number as two tools need for the B. The strange thing about the list is that many of the kits are listed more than once. I never noticed why until I really concentrated on this conundrum. There is one column labeled Cat # which showed a year in it like 1998. My determination is that this is the year a kit appeared in a catalog. Both the B and the Excelsior would have been shown in the catalog for several consecutive years. The Excelsior came out one year before the B but both kits looked to be available in every year the B was produced. With the volume of kits produced during that time, I doubt that the company at the time would have produced enough inventory to last for four years, then permanently alter the tool to create the B. We landed a copy of the B and compared it to the Excelsior firsthand. There are definite shared parts as well as completely unique parts. The detail of the top saucer is much more crisp on the later Enterprise B than the Excelsior and although some injection points are close, they don’t match exactly. The troublesome part is that some sprues with many common parts have had one part switched out. That’s where it gets dicey. My theory is that the saucer top, the belly of the secondary hull, the base and the other sprue of parts for the B are all on one tool. This would leave the saucer top intact as the Excelsior but I think some of the other smaller parts may have been switched out. If these were done as tool inserts, we shouldn’t have a problem. 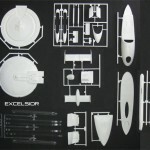 In any case, if we find that the Excelsior parts have been lost, have a lot of existing tooling for the kit gets us a long way. Retooling the missing parts should be affordable to do at some point. So where do we stand right now? 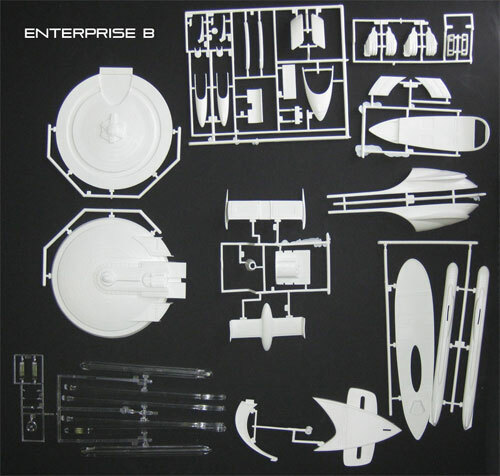 We are having the Enterprise B/ Excelsior and Reliant tooling moved to our factory to have test shots done. This is really the only way to know what we really have. Have we decided which kit to bring out? Right now, it looks to be the Reliant just because it is easier to move ahead with not knowing what the status of the other tool is. We do have some ideas for the Reliant which I think Star Trek model kit fans will like but we won’t be making a final announcement until we receive costs back and we are sure we can carry our plans through. As for the Excelsior/ Enterprise B, I’ll keep you posted. One way or another, one kit or the other will be back out again some day. So it’s the middle of January already. Needless to say I’m embarrassed that I haven’t been able to keep up with blog posts like I would have liked. As usual we are buried with responsibilities split between our model kit lines and our Forever Fun holiday line. Every time we see a light at the end of the tunnel, it caves in again. Maybe one of these days we’ll get to take a breath. We ended up with 13 sci-fi (genre) releases in ’09. 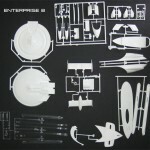 We’ve currently got 36 on our plan for 2010 including new subjects from the latest Star trek movie and a 1/25 scale Batmobile among other possibilities. We’ll be bringing back spiffed up fan favorite ships from Star Trek and a couple that haven’t been seen in decades including the K-7 Space station (another long lost kit is scheduled for later in the year…). We’ve got plans to bring back other long lost non-licensed model kits including the Pilgrim Observer and haunted Glo-heads. We’ll be gearing up for Wonderfest soon where we’ll make some schedule announcements for the second half of 2010.